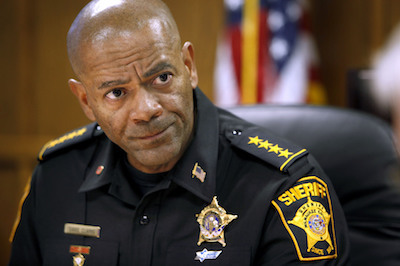 David Alexander Clarke Jr. or Sheriff Clarke is the sixty-fourth sheriff of Milwaukee County, Wisconsin. While originally appointed by Wisconsin Governor Scott McCallum in 2002 to fill a vacancy, Clarke has been re-elected four times (2002, 2006, 2010, and 2014). Clarke is one of a handful of African American sheriffs in large counties across the United States. Sheriff Clarke has stirred up controversy and admiration for his tough stance on crime and his strong criticism of the Black Lives Matter political protest movement. While most of his supporters nationwide are Republican, Sheriff Clarke is a registered Democrat and has been elected by an overwhelmingly Democratic and white constituency. This, however, was offset in 2016 by his high-profile support for presidential candidate Donald J. Trump and his role as a speaker at the 2016 Republican National Convention. Born and raised in Milwaukee, Wisconsin, Clarke was one of five children. His father, David Clarke Sr., was a United States military veteran. Upon graduating high school, Clarke went into the field of law enforcement, joining the Milwaukee Police Department in 1978. Clarke served many different roles within the department, spending time as a patrol officer before being promoted to the position of homicide detective. In 1993 Clarke became a detective lieutenant, and in 1999 he was promoted to captain. While serving in the MPD, Clarke went back to school, earning a Bachelor’s Degree in Management of Criminal Justice from Concordia University Wisconsin, located in Milwaukee (1999). As sheriff of Milwaukee County, Clarke became a controversial figure. Clashes with local government officials over budget cuts, his vocal support for gun ownership, and his proselytization of the Christian faith failed to push away Democratic or Republican voters, however, as the sheriff now serves his fourth term in office. Clarke’s right-leaning views on race, especially pertaining to the black community, have made him somewhat of a celebrity among social conservatives. He has been very critical about the behavior and culture of inner city African Americans suggesting that their own actions help to perpetuate the poverty and alienation they often criticize. More recently, Clarke has taken on the Black Lives Matter movement, suggesting that it is generating increasing tensions between African American communities and police departments while ignoring rampant crime in those communities. Clarke has been honored with numerous awards from law enforcement organizations, Second Amendment advocacy groups, and conservative causes. Sheriff Clarke and his wife, Julie Clarke, reside in Milwaukee. Clarke serves on the board of the greater Milwaukee Boys and Girls Club and is a member of various sheriffs’ organizations. According to his campaign website, he has a pet dog and a pet horse. His favorite musician is country singer George Strait, and his favorite television show is South Park. “Meet David A. Clarke Jr.,” The People's Sheriff PAC, 2015. http://thepeoplessheriff.com/meet-sheriff-clark/; “Meet the Sheriff: Milwaukee Sheriff David A. Clark Jr.,” Go Milwaukee, http://county.milwaukee.gov/MeettheSheriff9152.htm; Jessica McBride, “Sheriff David Clarke: 5 Fast Facts You Need to Know,” Heavy.com, August 15, 2016. http://heavy.com/news/2016/07/sheriff-david-clarke-milwaukee-black-lives-matter-republican-national-convention-you-tube-cnn-quotes-don-lemon-guns-baton-rouge-trump/; Janell Ross, “Who Is David Clarke Jr. and Why Are so Many Republicans Excited about This Democrat?” Washington Post, July 18, 2016. https://www.washingtonpost.com/news/the-fix/wp/2016/07/18/who-is-david-clarke-jr-and-why-are-so-many-republicans-excited-about-this-democrat/; “David A. Clarke Jr.’s File.” Politifact Wisconsin, Milwaukee Journal Sentinel, http://www.politifact.com/personalities/david-clarke-jr/. “Meet David A. Clarke Jr.,” The People’s Sheriff PAC, 2015. Excited about This Democrat?” Washington Post, July 18, 2016.